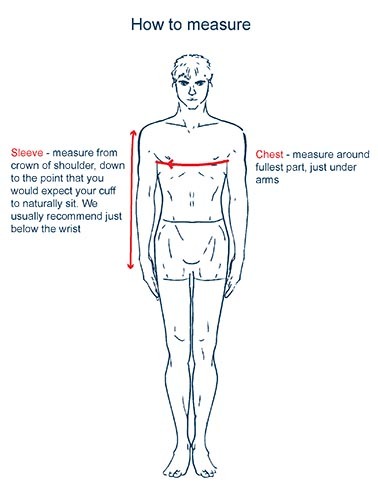 To ensure your bespoke garment fits impeccably, we have established a size guide to aid with your self-measurements. If you require any further assistance, our trained tailors will be more than happy to advise. You can contact us via telephone on 01274 711 101 or use our Live Chat feature. Our made to measure garments include a consultation, where you will be measured by a member of our team. For ladies measuring 5'8" or below, we would recommend a regular fit. For ladies measuring 5'9" and above we would recommend a long fit. For our long length option we increase the length of the sleeve and body by 2.5cm. Our model is 5’8” and a dress size 8. Our model is 5’8” and a size 26" (dress size 8). Our model is 5’6” and a size 34 (dress size 8). Our model is 6’1” and chest size 39", he is wearing a regular.